Pink Uplights are this year’s wedding trend for receptions. Highlighting a table centerpiece, spilling up and onto the ceiling, adding a colorful splash to architectural details and dance floors… uplighting has become a fresh way to add visual excitement to a wedding. This dramatic effect can really change the look of a location. If possible, ask for a test run. It’s important to see an accurate display at the same time of day as the day of the wedding. These lights will be more effective at night, indoors or with a darker environment. The lighting rehearsal should include all the available color options. 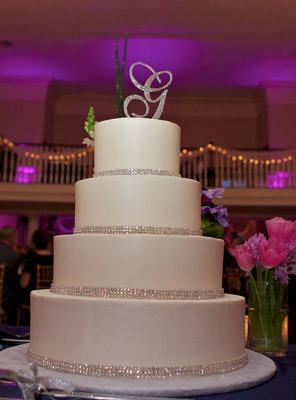 Custom color choices may be available to match or complement your wedding color palette. The majority of the weddings I photograph are evening affairs. That’s a perfect place for the uplights to make a big impact. 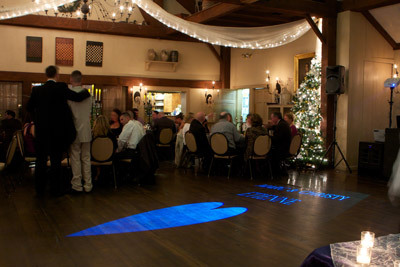 Turn your reception into a nightclub experience, customize some signage with projected light, and dine under spotlights with your sweetheart table on stage. I love the effects of today’s digital light display systems. The possibilities are amazing. Changing colors, synchronized to music, completely customized…make it dinner and a show! Choosing a location that has charm is the first step. Finding a location with a historical or novel theme, interior design, interesting lighting or windows will add photographic interest. Old inns, waterfront bed & breakfast, hotel suites… even your parents’ bedroom could make excellent choices. Good lighting is essential to great photography, and your make-up artist and hairstylist will appreciate it as well. You cannot assume that all places with have all modern conveniences. Most places have a list of the typical amenities they offer. Hair dryer, iron and ironing board, internet, mini-fridge, kitchen/bar area, air conditioning, heat, electrical outlets (yeah, it seems obvious, but you’d be surprised!). What else do you need? Not so simple, but creating a list will help make it happen. The Wedding Day Kit should contain everything that you could possibly need while getting ready and during the entire wedding ceremony and reception. For the Wedding Night Kit, you’re on your own! Think – Eat, drink, and get ready. That’s the idea. 1. The wedding outfits are top priority. Guys and gals have their own list and responsibilities. Dress, veils, tux, bow ties, shoes (maybe a more comfy pair for late night dancing), accessories, jewelry, etc. Doing a test run will help to ensure that everything fits properly and is well organized. Undress your test run into your suitcases. Add a mini sewing kit, scissors, mini Kleenex packets, and mints (don’t forget these!) to both suitcases. Ladies should have all the fav beauty products, assorted pins (hair, safety, straight), press powder or “shine sheets” (Body Shop and beauty/spa stores have these tiny pocket packs of face powder on disposable sheets – yeah! ), mini hairspray, lipstick or gloss…depending upon the lady, I’m sure there’s more. One last thought, have the florist deliver the flower bouquets, corsages, or boutonnieres to the suite. 2. Drinks/Libations. Decisions, decisions. Having both non-alcoholic and alcoholic choices makes sense. Mini water bottles are always a welcome convenience for your family and wedding party. Having a plan for keeping the champaign or beer ice cold, having a bottle opener, glassware, coolers. Lately, I’ve seen all types of champaign cocktails, Bloody Marys, tequila shots, and gallons of Cosmos. 3. Snacks. It’s important to get some food in you. Wedding days are long, busy times where eating takes a back seat for most couples. Start the day off with a solid foundation and make it special. This could be a breakfast idea, a sandwich board, canapés, or even room service. Whatever the food cravings and luxurious treats you want can be attained in this age of gourmet take-out, internet ordering, and prepared foods like Whole Foods and Harvest Co-op have daily. Perhaps, preparing something homemade will add a special touch. Make your choice, and make a plan. 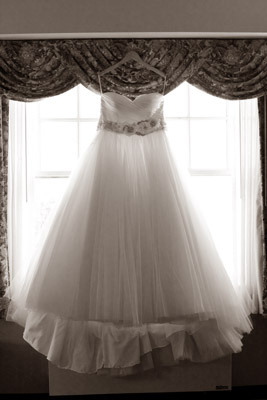 The bridal suite, whether elegant or campy, quiet or crazy, is a magical place where all wedding days begin. Excitement and anticipation are hard to conceal. I enjoy capturing their connections. 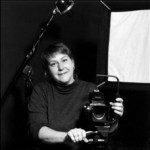 Watching as a photographer, I see many opportunities for both candid, intimate moments and formal, posed portraits. Great detail shots appear in the context of bride’s preparation. The bride looking at herself in the mirror, a quick toast with the girls, a moment of quiet before the rush… Let’s get this day going! Cristina Hajosy's Wedding Insiders Journal provides weekly wedding tips to help you plan a great wedding!